Bootleg Bacon, so good, it might be illegal. Since joining the Charcuterie Challenge our farmhouse has been all a-buzz about meat and preserving. We missed the duck prosciutto challenge but will make that up later, however, when the apprentice challenge was announced with a salt-cured BACON we were ecstatic, the kids got all silly and wiggly with the idea of it, after all, bacon IS a food group! Our family got right to task with our bacon recipes. The kids lobbied for bacon dipped in dark chocolate, I figured lardons with baby chicories/endives and housemade farm cheese with a nice vinaigrette, Mr. Pink Guitar wanted to showcase his famous bacon-wrapped sweet peppers stuffed with bleu cheese. We are newbie hog farmers, so we have pork! Or so we thought, we were ready, the hog was ready, finished on sweet potatoes (rooted right out of the field), the appointment had been made with the processor (no easy feat during deer season). Then the snow came, the truck got stuck and we missed our window. No worries, we would just go buy some local belly from someone else around here…and this is where we hit a little snag. Local butcher shops have closed down. Most of the local processors butcher deer and the occasional farm animal, not for resale. Availability of specialty cuts of meat appear to be a thing of the past. Even with our own meat, I’m challenged to find a processor that will scald the hog, i.e. keep the skin on and get rid of the hair. Most processors around here only skin the hog, which is non-traditional and wastes a lot of wonderful fat and also means you can’t smoke your hams (hams must be smoked with skin on, or so I’m told). 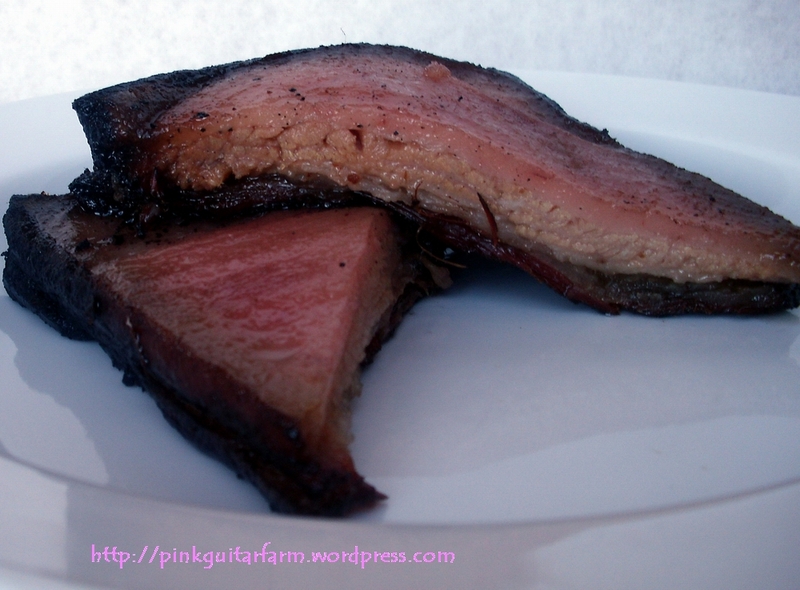 What has happened, here in the South where people love BBQ and pork? Cheap meat, that’s what. 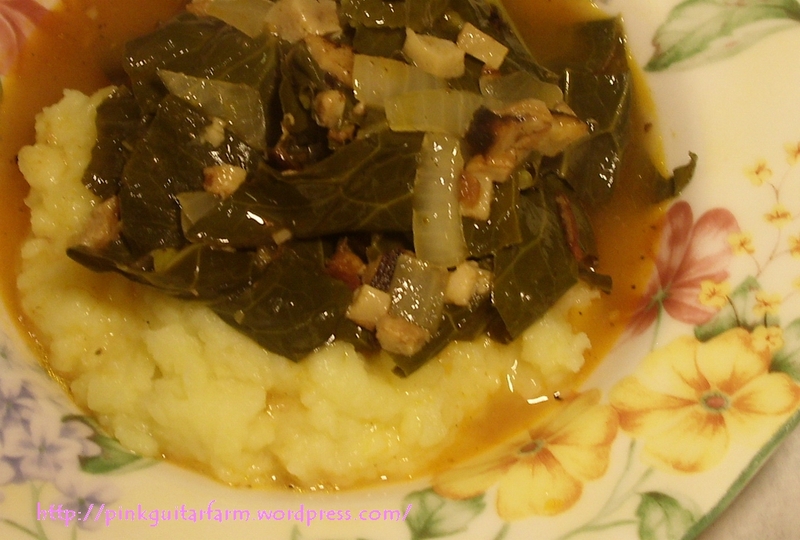 Some of the best Southern food comes from living frugally. These days that frugality has been won over by the supermarket mentality and cheap prices due to volume discounts. It seems unlikely that price competition will ever be a component of specialty shops, so what about awareness of humanely raised meats and subsequent health benefits? Not likely on a mass scale, but locals I talk to are aware or coming around with regard to the lack of quality meat at the store and have concerns about what actually goes into the meat. What a conundrum and depressing outlook for a new hog farmer! 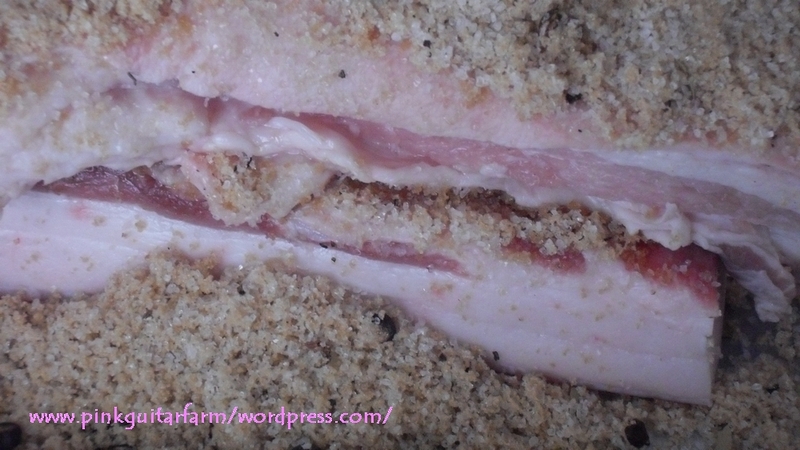 I did finally find humanely raised pork belly from a local farmer (a story in itself) so as you might imagine, I was quite relieved to have my pork belly, as I also began rethinking my farm business plan. When we moved to the South I figured meat preservation was a given, that every town had a Benton’s, that I would be immersed in a culture of unique and imaginative tasty uses of the whole hog. Well, Benton’s is quite busy these days, but their clients are definitely not all local. The Internet and a few famous chefs just might have saved Benton’s, and if that’s what it takes, so be it! I hope more specialty shops follow their lead in this niche. We were lucky to find our huge pork belly. We sat looking at it in awe wondering how big that pig must have been to make such an exquisitely ginormous cut of meat. No doubt, worthy of a Lady Gaga dress. When we got our belly, we kept checking the picture in the Charcuterie book identifying the different parts of the pig to comprehend where all the goodness originates (page 34). 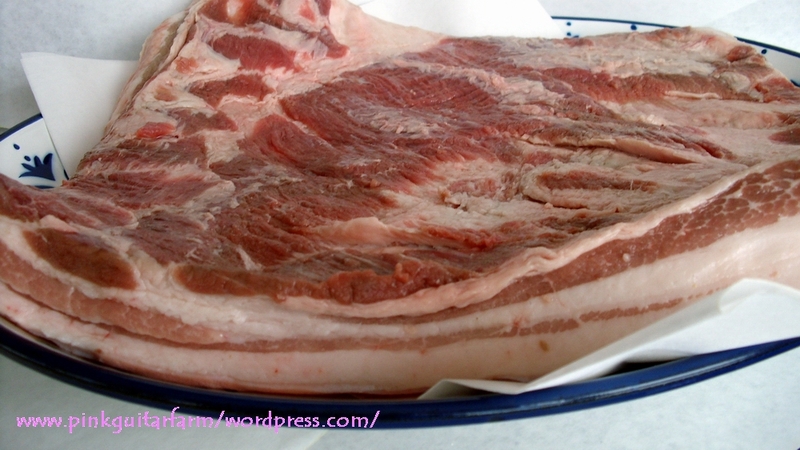 It’s really astounding to think about the range of flavors that can be coaxed out of the pig. We are even more enamored with our Pink Guitar Porcine’s now that we sit on the cusp of comprehending their vast culinary potential. We opted for the salt/brown sugar cure with as many spices as we could find. The aroma of the juniper berries alone was enough to make me reach for the martini glasses. 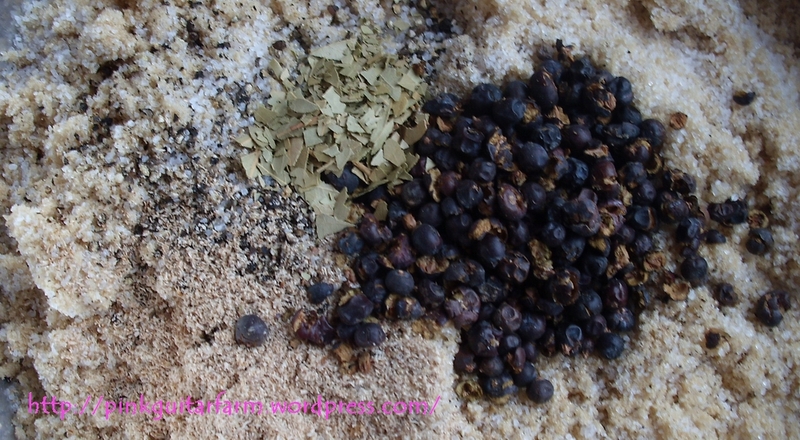 Note to self, when preserving, one can never have too much salt, brown sugar or spices on hand. We did not try the pink salt this time. We avoid chemicals as much as possible, however, after researching pink salt and understanding that nitrites occur naturally in things like celery, we will keep pink salt #1 and #2 in the pantry to be used according to the minimums required by a recipe. Oddly, I’m finding unexpected similarities between homemade bacon and moonshine here in Middle Tennessee. Of course there are books about how to make moonshine, just like there are books about making Charcuterie. Not to say that there are similarities between these two books, we’re talking completely different leagues here, but, both books are about a craft that is being forgotten, or rather, disappearing from our kitchens/backwoods, one legal, one not, crafts that are somewhat esoteric – definitely not mainstream. Both of these crafts were common practice not too long ago – when BOTH were legal. When I went out and talked to locals about my Charcuterie Bacon Challenge I encountered skepticism, concerns about difficulty and danger – regarding curing bacon… but not about making moonshine. Say what? How about being empowered to make superior food at home with incredible texture and flavor that is downright delicious? So what, exactly, are the similarities in comparing the crafts of curing bacon and making moonshine – in addition to both being methods of food preservation? They require similar inputs: corn goes into the pork and is used in the production of moonshine. Sugar may be used in the curing of bacon or in assisting with the fermentation of the mash/beer for moonshine, advance planning is required, timing is important and attention to detail is critical for safety. The end product can be wonderful if done correctly, or dangerous, if done without care. Both of these crafts are rarely attempted at home (as far as I know) and yes, one of them is illegal. And no, I don’t intend to ever break the law. 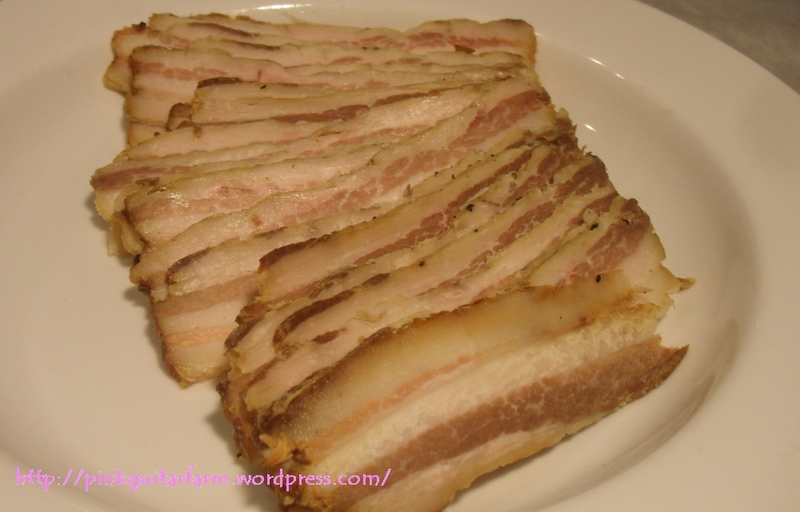 Lost art or not, dangerous or not, I found my home cured and smoked bacon to be so incredible that I don’t see myself purchasing that squidgy, cloying stuff pumped full of whatever, passed off as bacon at the grocery store EVER again. I’m a bacon snob now and it’s not about expense (well, within reason) or pretending to be a foodie or considering myself special because I found some long-lost artisan skill. I’m a bacon snob now because it’s a no-brainer, especially if you buy a whole or a half hog, it’s just BETTER. The smoked result smelled fantastic. I looked at it, cut off the rind, examined it closely and smelled it again. It begged for greens. I don’t know why and wasn’t planning on preparing greens. I have a deep respect for Southern Greens. As you may know, Southern Greens are traditionally prepared with stock or water, a ham hock or bacon drippings, greens and some type hot pepper sauce or pepper spice. I have the utmost respect for a dish that was inspired by destitution and scarcity, but this bacon compelled me to make my own version (perversion) of greens, so I hope this is not seen as a gross misinterpretation of a traditional recipe, rather, a way to eat tender collard greens with a potlikker so good, you might want to drink it. 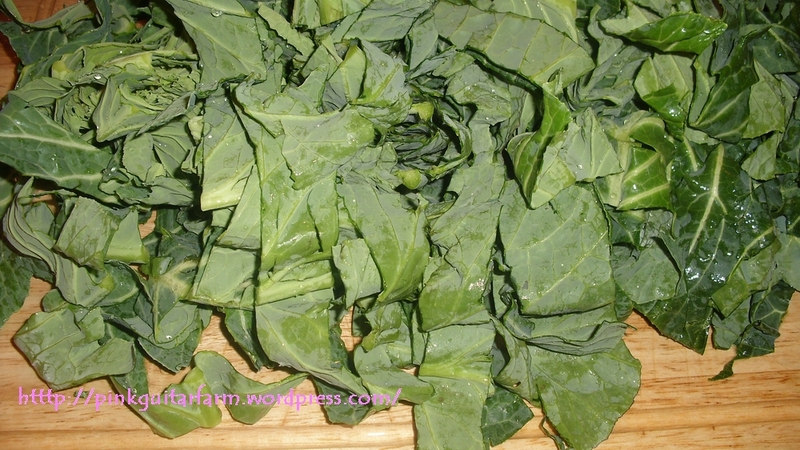 2 Bunches of collard greens, (I used collard – they stand up well to the heat, you can use kale, mustard or cabbage greens but these will change the flavor. If you use spinach, Swiss chard or beet greens make sure to add them chopped just a few minutes before serving). Chop a 3 pound slab (or so) of home cured, applewood smoked, bacon that has been rendered at low heat in the oven at 200 degrees for a few hours. As many cloves of garlic you can stand, smashed, chopped. 2 medium yellow onions, chopped. ½ a bottle or more of your favorite Bloody Mary mix. 10 medium Yukon Gold potatoes, about 5 pounds, chopped and boiled until tender, smashed with butter, a little milk, salt and pepper (and, if you like, chopped garlic or nutmeg). You want these mashed potatoes firm. These are prepared separately as a way to mop up that awesome potlikker. Saute the onions until tender (in bacon drippings if you wish) add the bacon and the greens and fill the pot half way with water. Cook down on medium heat for about 10 minutes. Add seasonings, spices and Bloody Mary mix and cook for about 20 to 30 additional minutes, until the greens are tender. 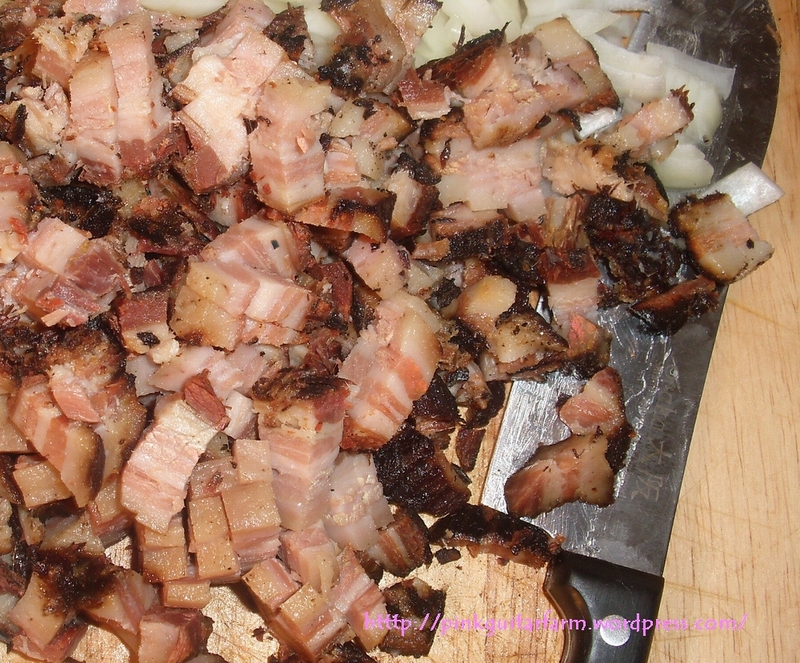 The smoked bacon should dictate the salt and seasoning, remember, it may be different every time you make it due to the nature of the size of meat that you cure and the way it is cured. 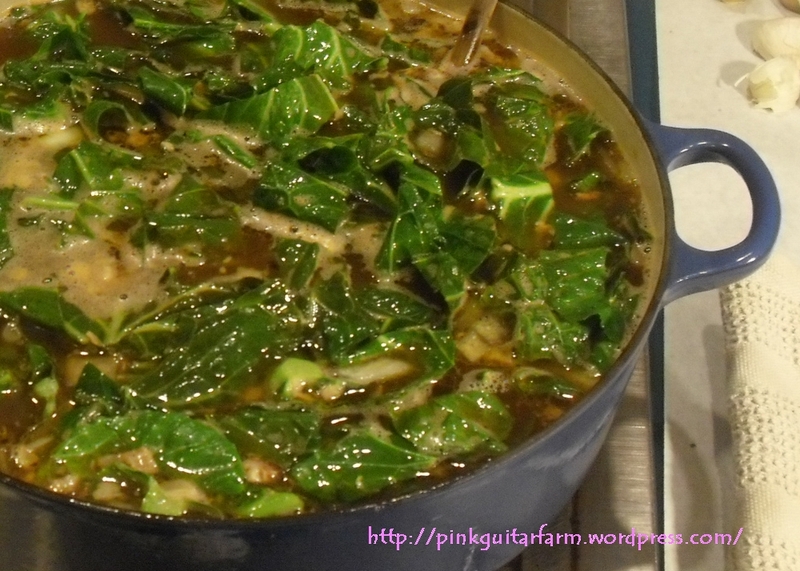 This pot of greens was soulful, harmonious, delicious, decadent, and sumptuous, and the little bits of fat were square silky pearls – like finding treasure! No, I did not feel guilty. The idea behind using local humanely raised meat is to use more parts, sparingly. Any left over potlikker? 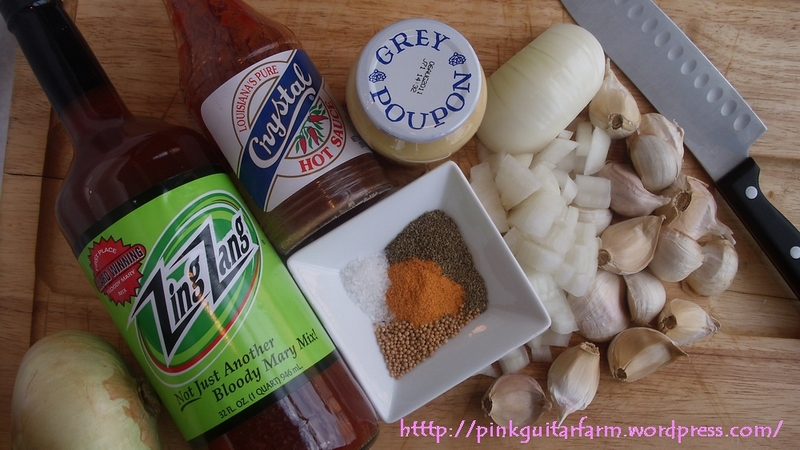 Add it to a cooked pot of black-eyed peas or navy beans! This dish was stretched over several meals and we enjoyed every bit of it. Not only has the Charcuterie Challenge encouraged me to step up my blogging and get outside my comfort zone in the social networking scene to “meet” and discover a wonderful community of like-minded meat lovers, it has also gotten me off the farm and “out there” to get to know and interview my own community here in TN. After talking to one local – a fixture at Pucketts in Leipers Fork last weekend, he offered to teach me how to make moonshine. I was talking to him about bacon, and looking for a Zen Master Charcuterie mentor…But, of course the conversation turned to moonshine. So, this local, someone I’ve talked to several times, stipulated that if I research how to make “shine” legally and get all of my paperwork in order, he would teach me. I hope this is not my equivalent of “when the student is ready the teacher appears”. I’m waaaaay more interested in Charcuterie! He thinks I should start my own Micro-Distillery (now how do you think the market is out there for Pink [Guitar] Label Whiskey?). Maybe I can negotiate a trade, I learn to make moonshine legally and in exchange, teach him to make his own bacon. The way I understand it, moonshine is just like cured bacon, whiskey is similar to cured and then smoked bacon – they are the same thing, one is just aged in smoky barrels which gives it more color, depth and flavor. I ended up with 4 slabs of bacon out of that big belly. Two of them were cured and smoked, two of them were cured and roasted at a low temp. 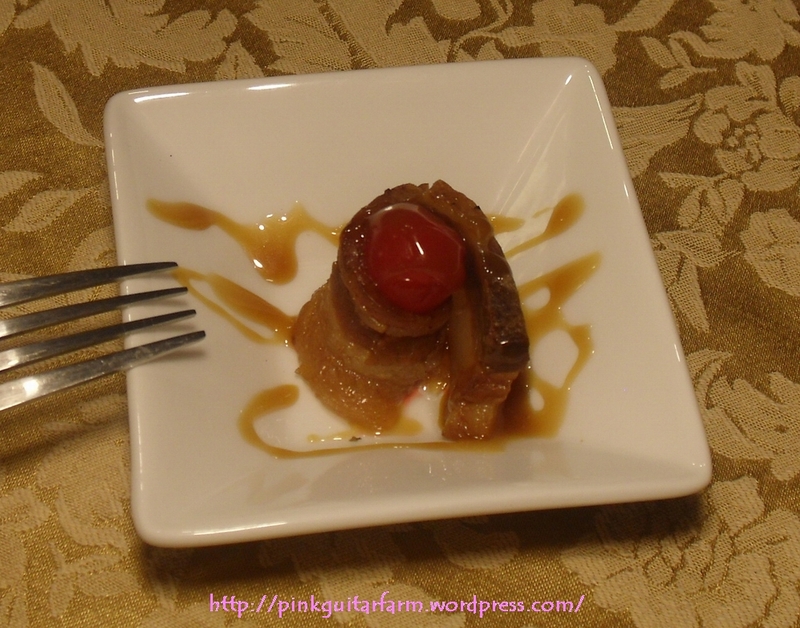 I liked the smell of the baked bacon because the spice was noticeable, yet subtle – better for dessert! Roll sliced bacon and place on skewers. Bake until brown and crispy. Top it off with a moonshine cherry and then spoon some homemade or processed caramel over the top. What is a moonshine cherry, you ask? The above cherries were purchased in a Tennessee liquor store and are made in Gatlinburg, TN.